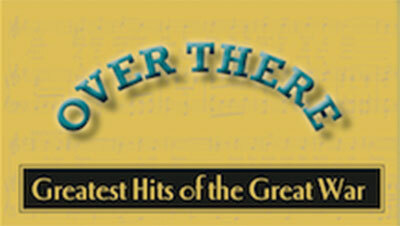 Over There: Greatest Hits of the Great War is an hour-long cabaret-style commemoration of World War I in this 100th anniversary period. It features 24 songs that topped the pop music charts of 1914-1918, performed by the versatile soprano Brett Kroeger and noted Broadway arranger and pianist, Christopher Denny. This fast-paced trip back to the war years of a century ago includes many of the best known, most amusing and most emotionally evocative songs of the era. Brett presents them with brief, contextualizing remarks in a sequence of send-off songs, trench songs, the Christmas Truce, songs of longing and loss, novelty songs and welcome home songs. Extensive program notes are provided, too. The show attracted an over-capacity crowd in the inaugural Tom Twomey Series at the East Hampton Library Memorial Day weekend 2015, following full house performances in December 2014 at the Liederkranz Club of New York City at the Greenwich Arts Society in Greenwich, Connecticut. Operametro.com published a Q&A with Brett about the program and reviewed the Dec. 13 show, calling it “a stirring . . . totally pleasing and enlightening hour of song, insights, history and memories . . . Kroeger’s singing, expression, and overall joie de vivre made for an entertaining and at times very touching experience . . . which brought an adoring audience to their feet.” The reviewer also noted the program’s intelligence and informational value and its showcase of “real talents and dedication to excellence.” The show played to another full house on Memorial Day weekend in East Hampton, Long Island, New York, as the inaugural music event of the East Hampton Library’s Tom Twomey Series in 2015. EQUIPMENT NEEDED: Piano, preferably grand or baby grand, freshly tuned.